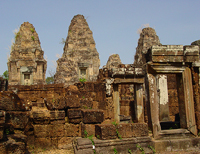 The following temple ruins are located in Siem Reap Province, most within the boundaries of the Angkor Archaeological Park near Siem Reap City. 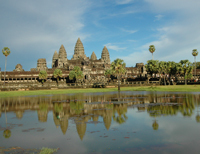 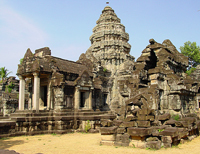 The temple sites with the Angkor Archaeological Park represent the ruins of the ancient Angkorian capital cities of the Khmer Empire (9th-13th century AD) and include the most famous Khmer temples including Angkor Wat and Bayon. 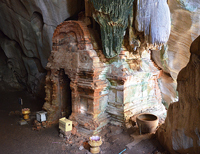 In the list below click on the temple name for more information and photos. 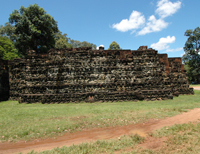 The walled city of Jayavarman VII. 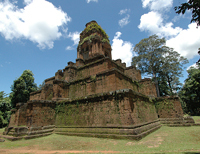 Largest temple in the Roluos Group. 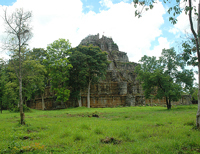 Temple pyramid near the South Gate of Angkor Thom. 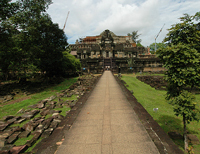 Distinctly Angkor Wat architectural style, but a lot fewer tourists. 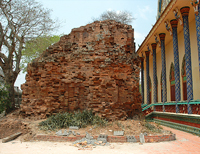 Citadel of Women. 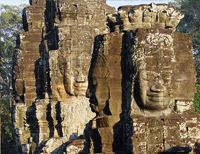 Some of the most beautiful carvings at Angkor. 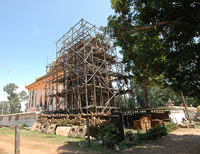 Newly restored and reopened. 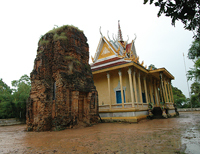 Look for the reclining Buddha on the west side. 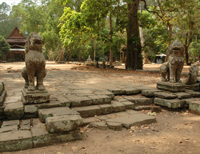 Three well preserved prasats in a quiet area. 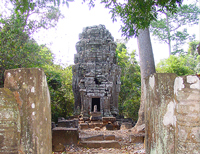 The Temple of Faces at the center of Angkor Thom. 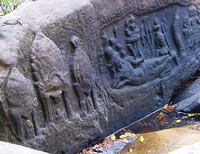 River carvings outside the park area. 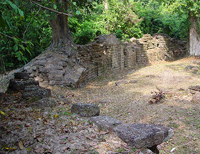 Little more than a wall. 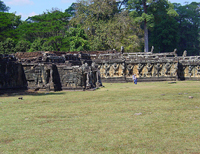 Large brick prasats, good lintel carvings and an active pagoda. 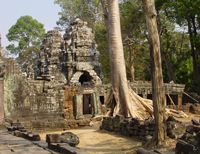 Full of interesting details: the different heads in each water inlet; the encoiled tails of the serpent; the statue of Balaha, a replica of which adorns the Siem Reap Airport. 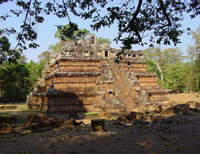 Scalable temple pyramid in central Angkor Thom. 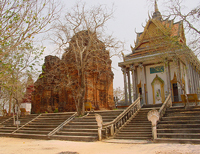 The traditional sunset hill, though very over-touristed at sunset these days. 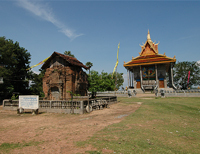 Hilltop prasats overlooking the Tonle Sap. 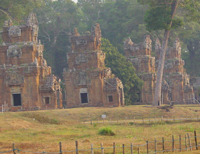 A dozen towers facing Terrace of the Elephants. 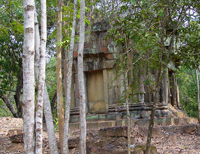 A.k.a: 'Monument 487,' 'Mangalartha,' reputedly the last Bramanistic structure at Angkor built in the Angkorian age. 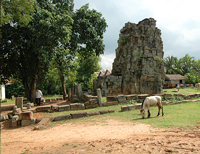 Temple of 'the Sacred Cow' at Roluos. 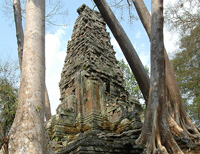 Tower on a mound. 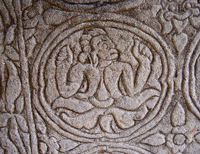 Good carvings on the gopura. 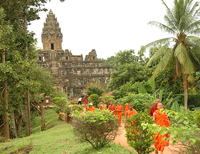 Pleasantly untourists group of Hindu and Buddhist temple near Terrace of Elephants. 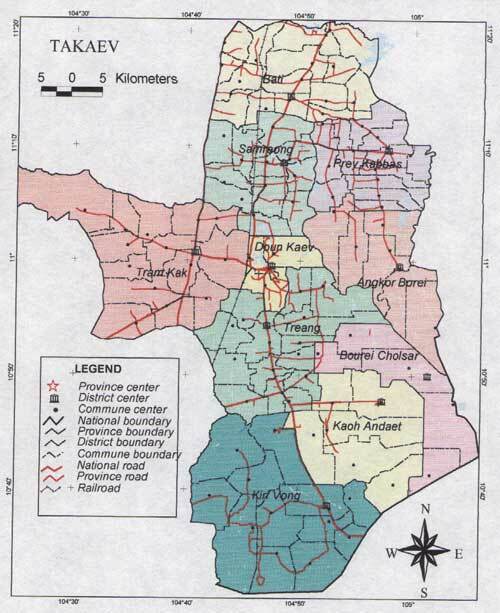 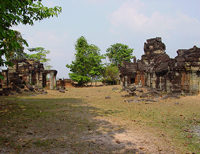 The first Angkorian capital city - Bakong, Preah Ko and Lolei. 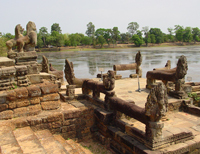 Interesting to note how the river has changed course over the centuries. 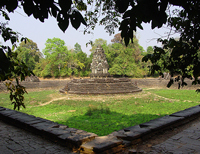 Royal baray. 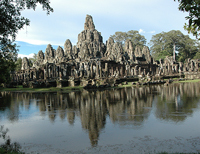 Good alternative sunrise/sunset location. 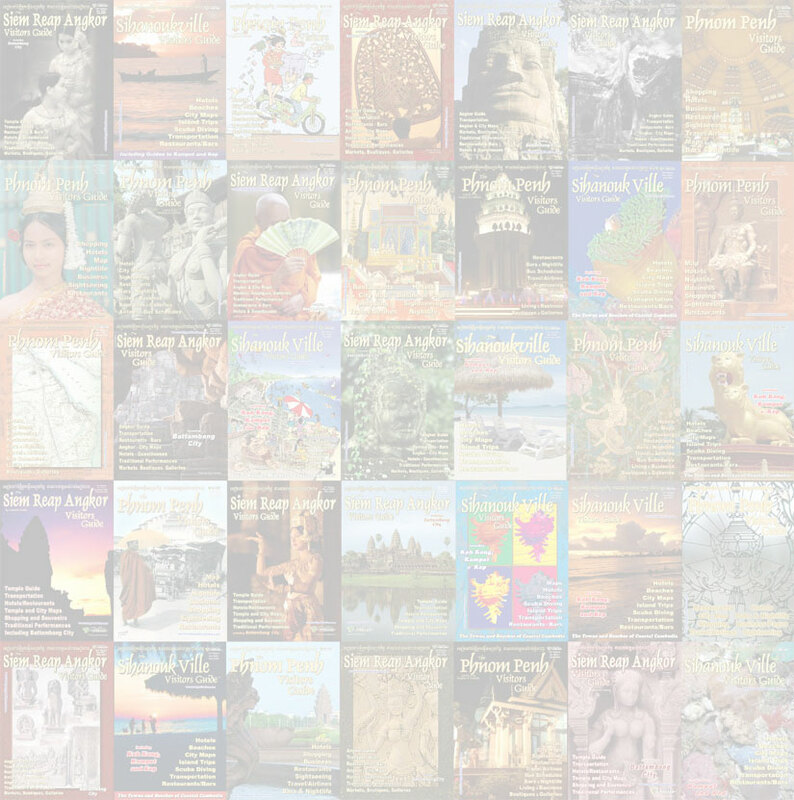 Big and kind of plain. 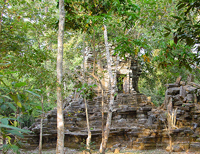 The jungle temple. 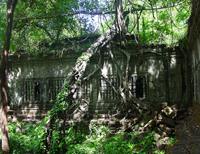 Sprawling monastic-complex, much of the original jungle overgrowth left in place. 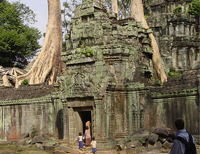 Classic 'giant tree on temple' shots. 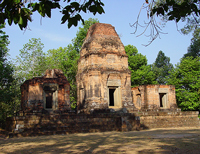 Another of the small 'hospital' prasats, similar to Chapel of the Hospital. 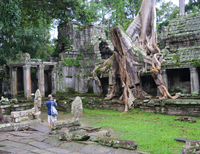 Fantastic little monastic-complex, like a miniature Ta Prohm. 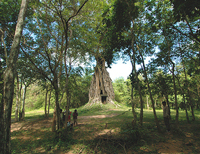 Very photogenic our-face towers with trees. 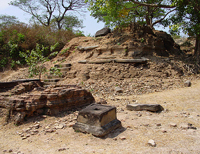 Also the site of an active pagoda. 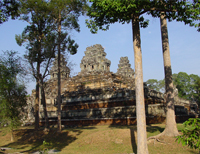 Elephants and garudas, lots of them. 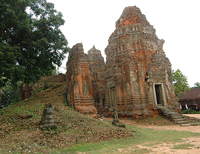 Picturesque little temple in very good condition. 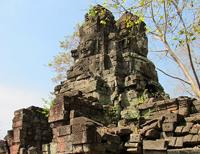 Whether wet or dry, the stone picks up colors beautifully. 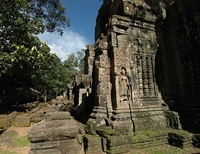 Photogenic. 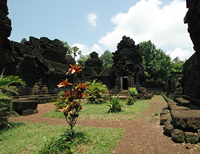 Distinctively Angkor Wat style temple in a countryside setting no far from town. 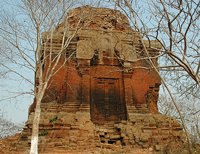 Remnants of an island temple in the middle of the west baray. 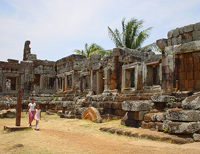 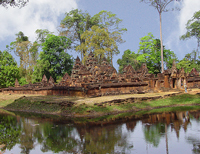 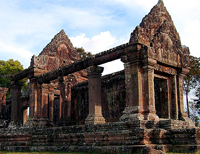 The following temple ruins are located in Kampong Thom Province in central western Cambodia. 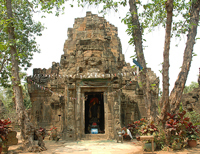 Kampong Thom Province borders Siem Reap province to the east and harbors one on the most important ancient Khmer temple complexes outside of the Angkor Archaeological Park (i.e. 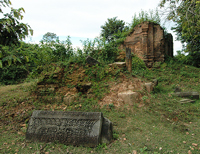 Sambor Prei Kuk) as well as dozens of minor ruins. 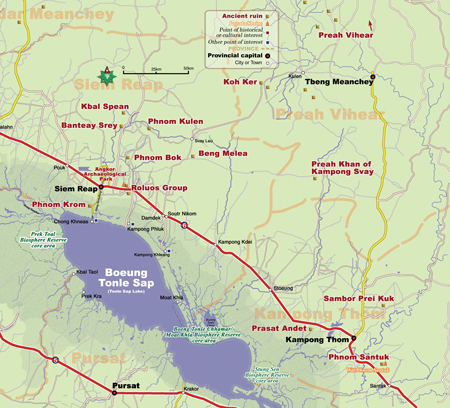 The road from Phnom Penh to Siem Reap (National Route #6) passes through Kampong Thom Province and within easy visiting distance of Sambor Prei Kuk and several of the minor ruins that lie just off the road. 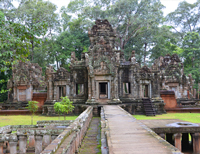 If you have the opportunity to take some sort of private transportation between Siem Reap and Phnom Penh such as motorcycle or private taxi it is possible to stop briefly and visit several ruins along the way. 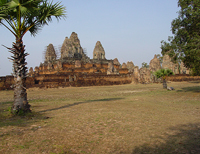 Extensive, archaeologically important temple complex. 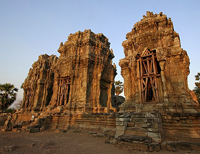 The following temple ruins are located in Takeo Province south of Phnom Penh, within a day-trip's distance. 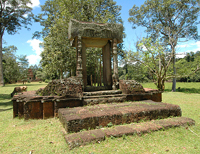 The pre-Angkorian and Angkorian-era temple ruins in Takeo Province, though not as impressive as the temples near Siem Reap, rank amongst the most historically and archaeologically important Khmer ruins in Cambodia. 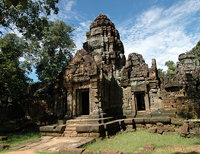 Most of the listed temple ruins can also be reached by bus. 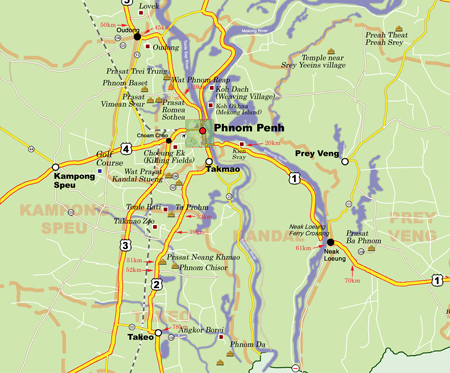 Regularly scheduled buses depart the bus station near Phnom Penh’s Central Market and follow the National Routes into the provinces. 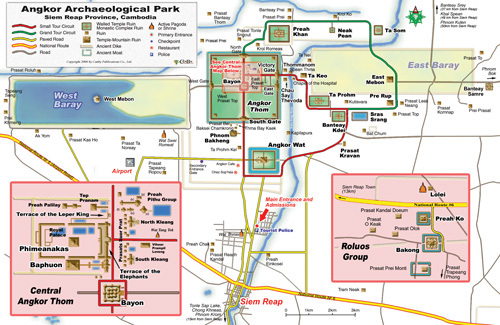 Most of the listed sites lie on or near a National Route. 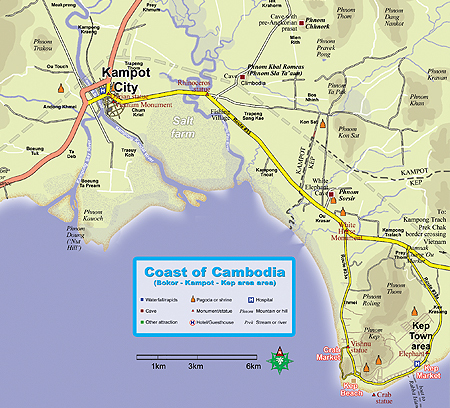 For sites located away from the National Route, onward transportation awaits bus passengers at the bus stops. 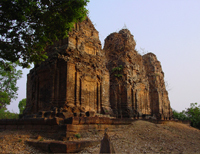 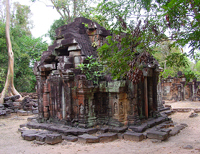 See the Temple Ruins Near Phnom Penh Map for Takeo province temples. 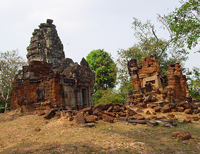 The following temple ruins are located in Preah Vihear Province, the province bordering Siem Reap Province to the northwest. 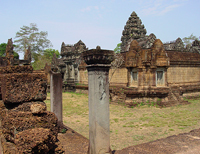 The Angkorian-era temple ruins of Preah Vihear rank among some of the more important and impressive outside of the Angkor Park area in Siem Reap. 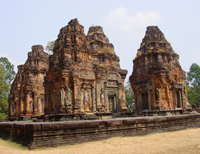 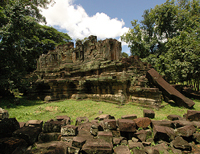 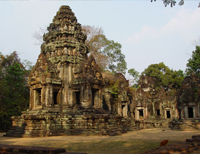 The temple complex at Koh Ker, for example, encompasses more than a dozen temples and represents the remnants of a rival capital city from the Age of Angkor. 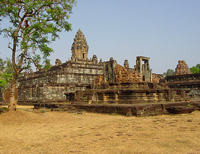 And the Preah Vihear Temple on the Thai border - the center of recent political controversy - displays a unique artistic style and stands with a commanding view of the Cambodian plain. 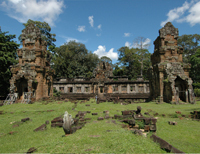 Some of the temple ruins of Preah Vihear are comparatively easy to reach, such as Koh Ker which is within half-day trip. 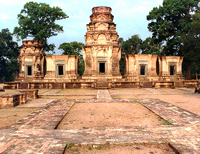 Others such as the remote Preah Khan at Kampong Svay requires significant more time and effort to reach. 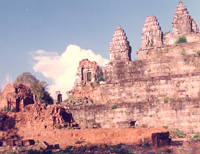 Unique ruins with a spectacular view of the Cambodian plain. 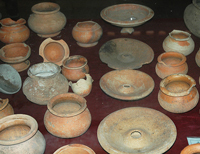 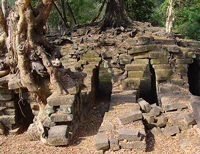 Pre-Angkorian ruin in a cave. 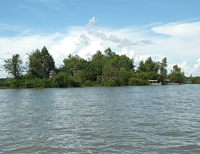 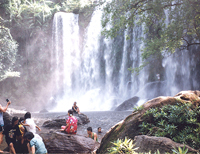 Kampot province, east of Kampot town, between Kampot and Kep.